How fabulous is Big Bear Lake CA? Homes for sale are nestled along the San Bernardino National Forest, whose incredible natural beauty is almost impossible to match. Wildflowers and snow punctuate the landscape according to the season. And year after year, you get to experience the dramatic changes the four seasons bring. Tucked away from the hustle and bustle of the city, you find that Southern California’s laidback atmosphere truly shines here, and “on vacation” becomes your year-round definition. Just over two hours from L.A. on I-210 all the way, Big Bear Lake is so easy to get to ... but so hard to leave. And who could blame you for wanting to stay? Bear Mountain and Snow Summit ski resorts are nearby for all levels of winter sports. You can even explore on horseback during the cold. And at both ski resorts in the summer, it’s an easy switch from ski poles to golf clubs or a mountain bike. Hello. I’m Diane Chasey-Cooper, REALTOR®. Welcome to my online office where I’ve assembled lots of good information to help you learn about Big Bear Lake and buying or selling a home here. There’s no cost or obligation for any of it, so please help yourself and enjoy. If you’re looking for a second- or even third-home retreat and are thinking about Big Bear Lake, give me a call and come on up. I’m happy to show homes on the weekend so you can come up and have a good time while looking. We have a nice village area with good restaurants and shopping. And of course in season, the snow skiing is great. You can look at homes, enjoy your weekend and then have an easy drive back to the city. 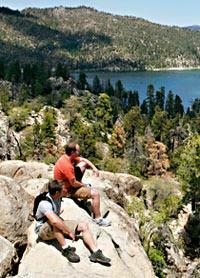 Three different routes will get you into Big Bear Valley. But if it’s your first trip up, you definitely should come the back way on 38, which is a designated scenic highway. I always tell buyers this because it’s a wonderful introduction to the area and really sets the stage for the natural beauty you’re about to see. Recently, I showed a property to a husband and wife. It was fee simple land, which means someone can own it even though it’s surrounded by the national forest. To get there, we had to travel down a dirt road until finally we came to the spot where stood a 70-year-old antique cabin. Selling your home can be a difficult decision to make. But once you’ve decided to enter the real estate marketplace, selecting the right listing agent determines your success. Because of the Internet, the real estate marketplace has changed dramatically in recent years. At last report, nearly all homebuyers (93%) begin their home search on the Internet. This is important to you because choosing a listing agent who has a strong Internet presence and a fast, systematic way to get your listing out there in cyberspace, is critical to exposing your home to the most people possible. Only in this way can the large number of searching buyers and investors find it. I recognized early-on the importance of the Internet to getting your home sold at or near asking price in the shortest time possible. So I took an extensive course offered by the National Association of REALTORS® on how to “get connected” and apply technology and the Internet to my sales and marketing strategies. This very Web site you’re on now is one of the results of that advanced education. 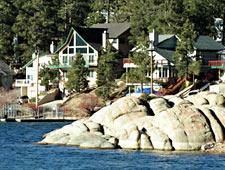 At Big Bear Lake, we’ve seen double-digit depreciation on certain properties. However, we reached the bottom, and now, values are coming back. Just recently, I saw some great sales up here—$500 to $600,000 sales that were bargains. Investors are jumping in. At the East end of the valley there’s an area called Sugarloaf, which has 25′x100′ lots. Those properties originally sold for about $40 and went up to about $120, with some of them going higher. Right now, they’re back in the $89,000 range. So they hit their peak and dropped. But now, they’ve come back and are selling. To get a little getaway cabin up here for $89,000 is very inexpensive. Also, the skiing has been fabulous, so people from Los Angeles, San Bernardino and even Orange County love to come up, go skiing and have a good time. We have a nice village area where they can go shopping and eat at good restaurants. We also have two major supermarkets and two movie theaters. The other option L.A. residents have to go skiing and breathe clean air is to travel all the way to Mammoth, where the High Sierras are certainly taller mountains with more snow. But coming up to Big Bear is hassle-free, convenient and makes a nice weekend trip. I’ve invested in Big Bear Lake real estate ever since my early days here. And I don’t regret one penny of it. I’ve bought cabins, fixed them up and re-sold them. Right now, I have one seasonal vacation rental as well as some vacant land here and out of state. I understand the ins and outs of real estate investing, and I always have my eye out for a good deal. So, if you’re an investor, let me know your interests, and I’ll keep you posted. 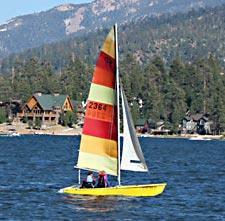 Currently, there are a number of distressed sellers at Big Bear Lake. And there are a number of financial institutions that are overexposed. If you’re looking for a great bargain, I can help you stay on top of the market here, as these assets are rapidly re-pricing. As we approach and reach the bottom, I know from past experience that these sorts of things generally translate into good opportunities. Most of my clients are referrals from past clients. It pleases me to say this because I know that a ll the marketing in the world doesn’t make up for what past clients have to say about me. Also, I have Big Bear clients who have been with me since the beginning of my real estate career. They’ve experienced my dedication to finding the right property for them, and they come back to me the next time they’re ready to buy or sell. This is because they know I give them all my effort. And I will do the same for you. If you’re buying and are like most other homebuyers, you’re worried about paying too much. Because I’ve lived at Big Bear Lake and practiced real estate here for more than two decades, I’m familiar with what’s for sale. And after being here for so long, I can pin point a home’s value. With my market knowledge behind you, you can rest assured you won’t pay too much for the home you love. And if you’re selling your home, my market knowledge and ability to pin point a home’s value give you the confidence to establish a realistic asking price that both keeps you in the game and prevents you from leaving money on the closing table. So, whether you’re buying, selling or investing, my list of satisfied clients, years of experience and in-depth market knowledge are yours for the asking. Give me a call and let’s get acquainted. 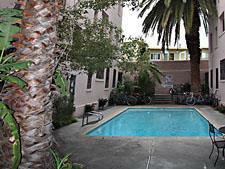 I also represent Cooper Properties in L.A., which has three lovely buildings with rental units available. All three buildings are secure, quiet and very well maintained. The first is in one of the most popular areas of Hollywood with stores, restaurants, theaters, banks, gyms and public transportation all within walking distance. The second is a charming Spanish-style building on N. Las Palmas Avenue, a quiet residential street with plenty of parking. Banking, shopping and restaurants are conveniently nearby. The third building is in the Culver City area and offers bachelor and one-bedroom units in an attractive Spanish courtyard setting. Some units have a private entrance, backyard and patio. For exact locations, contact information and rental details, please visit the Cooper Properties page of my Web site.